I had spent the summer of 1995 in Hong Kong smuggling Bibles and other teaching materials across the Chinese border where they were placed in the hands of the Chinese underground Church. From that time on I made a determined effort to finish my schooling as soon as possible so I could return to China as a missionary. By January 1998 I had finished my career as a student and was ready to begin life on the mission field. During this season in my life I was not closely connected with any church but had joined a mission organization based out of Tulsa, Oklahoma. Through this organization I received some basic orientation about living in China and a position as an English teacher in a Chinese university in southwest China. I arrived in the city of Chongqing only one month after graduating college at the ripe old age of 21. During the year and a half that I lived in Chongqing I learned Chinese while teaching English at the university. Being young and single I didn’t require much in terms of support. My position as a teacher provided me with $175 a month and an apartment to live in. I should note that when someone does overseas ministry through a mission organization, that organization doesn’t generally provide any support. In fact one must pay the organization for the services it provides such as training and counsel. Since I wasn’t closely connected with any church this $175 was my monthly lot while I lived in Chongqing. Since I was young, and my daily expenses consisted of only a few simple meals, plus the added luxuries of an occasional can of Coca-Cola and a package of Oreo cookies, I got along just fine! Chongqing is not very far from the province of Tibet, and though I had never met a Tibetan, God had given me a desire to someday go there and minister to the Tibetan people. While in Bible school I had learned of the desperate spiritual condition of this people. I learned that the land of Tibet was one of the most Gospel-starved lands in the 10/40 Window. So when I first arrived at the university I was excited to hear that there was a special program for students from Tibet. I was convinced that God would begin to fulfill the desire He had placed in my heart, and I praise God that in a small way he did give me a down payment on that desire. Tibet is one of the most sensitive political problems in China. So I was not surprised when my Chinese students freely confessed their hatred for Tibetans because “they wanted to rebel against the government.” My students continued to describe this “reproachable” minority by informing me that the two favorite hobbies of the Tibetan students were getting drunk and fighting. My American values of equality and justice for all led me to sternly rebuke the students who gave me this report. I would lecture them on the evils of racism and prejudice. “How many Tibetans do you personally know?” I would ask with a smug certainty of the coming answer. The expected and received answer was always a resounding, “None.” Though this argument did little to curb their racial disgust, in my mind it thoroughly proved that their understanding was skewed by the political enmity that kept the two peoples divided and had nothing to do with real first-hand experience. But soon after these classroom debates I met a recent college graduate from Tibet. His name was Dawa. Through my conversations with him I started to learn that though my Chinese students were immersed in communist propaganda and were guilty of hatred and stereotyping, a lot of what they said about the Tibetans was based on fact. Dawa had given up drinking and fighting years earlier and so he kept his distance from the other Tibetans on campus. He had learned long before that when relating with other Tibetans he had to either be ready to accept their forceful hospitality and generosity in regards to drink, or be ready to go home having won or lost yet another fight. As a foreigner I was given the liberty of kindly refusing any drink they might offer me, but I was soon to learn that even a foreigner was not exempt from Tibetan “hospitality” indefinitely. There were only about 30-40 Tibetan students at that university and I was restricted from regular contact with them by the authorities of the school. I thought at the time that this was only due to the sensitive political situation that existed between the Chinese, Tibetans, and Americans. The following story will show that my safety also played a role in such restrictions. Since the “limited contact policy” was not too strictly enforced, I was able to build some acquaintances with this mysterious group of students. I would occasionally visit them in their dorm room to try and learn their culture as well as share Jesus. My heart was drawn to this people knowing that they were among some of the most unreached people on the planet. One day I made the unfortunate mistake of entering their large dorm room (about 10 students lived in each room) on the second day of a group drinking binge. There were empty beer bottles everywhere as well as drunken Tibetans. Of course I was warmly greeted by the few conscious members of the party and asked to have a seat. I quickly realized that the best course of action would be to leave as soon as possible so I started looking for a gracious way to excuse myself. Most of them were fine with my kind refusals to drink, but one of the unconscious students began to come to and was excited to see me sitting next to him. It turns out he was not quite as understanding as his roommates. He did the first thing that came to his groggy mind. Desiring to be a hospitable host, this drunken Tibetan offered me a pint sized bottle of beer. He was unaware that I had spent the last several minutes refusing the generosity of my other hosts. This didn’t please him in the slightest and he would brook no refusals no matter how many smiles accompanied them. The other and slightly more sober students saw a storm brewing in their drunken friend. They grabbed me by the arm and started showing me to the door, double-time. As they shut the door behind us we heard the crash of one of the many beer bottles smashing against the door. With profuse apologies they asked me to go and then returned to their dark and depressing festivities. This episode didn’t quench my missionary zeal, but actually served to move my heart to even deeper levels of compassion and sympathy. I share this less than flattering portrait of Tibetan culture to illustrate some of the effects of darkness upon this people. By the string of Hollywood movies in recent decades focusing on Tibetan culture one would get the impression that they have much wisdom and light to offer the West in terms of spirituality. This is a satanically inspired fabrication, and couldn’t be further from the truth. Tibet is a dark place filled with demon possession, witchcraft, poverty, brutality and fearful superstition. 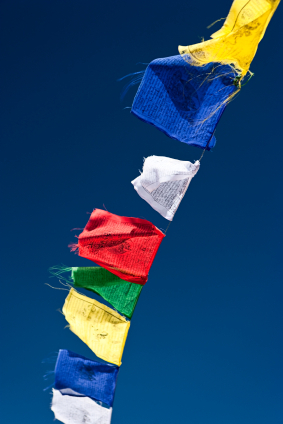 Over every mountain pass you will find prayer flags waving in the wind. With each gust of wind it is believed that one more prayer has ascended to the demonic forces of fear that control their lives. And with every prayer it is hoped, more than believed, that somehow the brutal spirits ruling their land will be, to some small degree, appeased with this fruitless tradition. Traveling through the harsh terrain of Tibet, one feels a deep hopelessness. The spiritual environment is as dark and ugly as the physical scenery is beautiful and awe inspiring. The financial poverty alone is severe enough to break your heart, but added to this utter destitution is the superstition that causes people to prostrate themselves before fierce and grotesque looking idols. In the darkness of Tibet there is no need for Satan’s forces to appear as “angels of light.” There is no need to conceal their true nature and form. Instead they can appear as the oppressive and fearful creatures they are, and they are free to demand the all consuming worship that terror is meant to produce. There is no appearance of redemption or light, all is darkness and evil. These spiritual forces are always ready to attack any glimmers of Gospel light that seeks to enter their territory. Besides the fear produced by the commonplace demonic manifestations, as well as a variety of mysterious illnesses readily poured out on the carriers of the Light, these dark spirits also make use of the Chinese government’s tendency to dominate and control. The few missionaries that are granted visas (i.e. residence permits) to live among the Tibetan people live under the continual threat of losing their access to this lost people. The rarity of these permits, and the continual prospect of having them revoked, often tempts these precious missionaries to err on the side of caution. It should be noted that these visas are not “missionary visas,” but “student visas.” The government would never permit anyone to live in Tibet that was there with the express purpose of preaching the Gospel. Though it is easy to judge the ministers that find themselves in this position, from experience I can testify that getting past this demonically inspired timidity is easier said than done. But I believe that the Church of Jesus Christ has been supernaturally designed to do it! The Spirit God has given us can fill us with uncompromising boldness if we will let him lead us. After being in Chongqing for a few months I had five weeks vacation to travel around China. Tibet was on the top of the list of places I wanted to visit. With my close American friend Sandino, and my close communist buddy XiaZhengjie, we started our 5 week trip by flying to Chengdu to purchase the special tourist visa needed to enter the Tibetan province. After receiving the permit we took the one hour flight to Lhasa, the capital of Tibet. We spent our time praying and seeing the sights as well as witnessing to the Gospel when the language barrier didn’t hold us back, and sometimes even when it did! We wanted to travel to another city four hours from Lhasa before taking the grueling 32 hour bus ride north to Xining, China. We spent four hours on a large bus with about 30-40 passengers, all Tibetan. We saw it as a great opportunity to share the Gospel. We were sitting in front, so we started with the driver and his ticket-collecting assistant. By this time I could speak enough Chinese to at least get a conversation about the Gospel started, and my communist buddy was already becoming a great preacher of the Gospel due to his role as our translator. In fact by the end of the five week trip he could share my testimony and the basic Gospel message without me having to say a word. I praise God that years later he abandoned his communist faith and became a believer in Someone greater than Karl Marx and Chairman Mao. At first we were surprised at the happy response the two Tibetan men were giving the message of the Gospel. But within 15 minutes or so, after testing their listening comprehension, we realized that they didn’t know enough Chinese to understand what on earth we were talking about. They were just happy to make some foreign friends, though they couldn’t understand anything more than a basic understanding of Chinese would permit. This was disheartening but we decided to try and address the entire population of the bus. Again we found that no one could understand more than the fact that we were from America and we liked Tibet. So we realized that a clear presentation of the Gospel was not going to happen that day. So we asked if we could put on some music. For the rest of the trip the driver and the passengers all listened to the tape of Vineyard worship music with delight. Sandino and I took some time to teach them a little English as well. We would stand up and say “Jesus,” then after motioning for them to repeat, they would all shout “Jesus” in unison. After mastering the first word we moved on to “Jesus is.” In a short time we were able to complete the chant with “Jesus is Lord.” For the next five minutes or so and then intermittently upon the rest of the journey we had this group of unreached Tibetans who had zero knowledge of the Gospel shouting “Jesus is Lord” as we drove along the mountain roads of Tibet. We stopped about half an hour from our journey’s end at a beautiful lake to drop off four freshly recruited Buddhist monks at the monastery beside the lake. 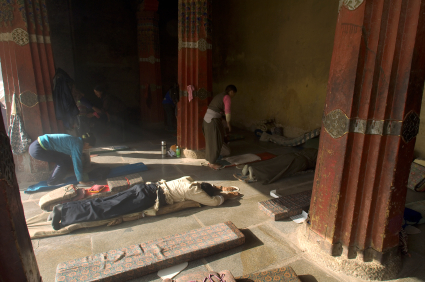 The monasteries of Tibet are dark places of demonic worship and sexual abuse. Tradition demands that the first born son of every Tibetan family is offered up to serve at the altar of these demon dens, even as the first born sons of Israel were slaughtered in accordance with the dark edicts of Pharaoh. They asked us to sign the back of a picture they had as a souvenir of the day they joined the monastery, and of the day they made two American friends. We signed it “Jesus is Lord,” in hopes that one day someone would translate it for them and they would come to understand what we were trying to communicate to them on the bus that day. On the day of this bus trip our youthful zeal filled us with excitement. We felt so encouraged to be able to get a whole bus of lost Tibetans chanting “Jesus is Lord.” But as the years have passed this memory has become an illustration to me of the complete darkness that keeps Tibet bound. I can no longer feel as I did that day that at least we made some “spiritual” impartation, even if we weren’t able to share the Gospel with them. I am all too aware that it is likely that the people on that bus are still as ignorant of the Good News as the day two of God’s children became their traveling companions for a brief moment in time. And it is all too probable that the young monks were soon after filled with demons through a mixture of satanic worship and sexual molestation. I am sad to say that the cycle has probably come full circle and those four sacrificed children, have probably by now become abusers themselves. To me this interesting episode in my life as a missionary is only a reminder of the depth of darkness that consumes the lives of billions of souls in the 10/40 Window. This is the place and this is the people that Dawa came from. When I met him he had never heard the Gospel and had never met a single Christian. He was lost and didn’t know that he could be found. But God loves Tibet, and God loves Tibetans. And God had come to save Dawa through the power of the Gospel message and the conviction of the Holy Spirit. Dawa was different from the average Tibetan I had met. Not by nature, but by decision. He had gotten tired of the cycle of drunkenness and violence and chose to opt out of Tibetan social life on campus. Due to his partial rejection of Tibetan society he was open to the things I began to share with him concerning Christ. He was a devout worshipper of the Dalai Lama, as all Tibetans generally are, but he had already made the important decision not to follow every path his culture and society had ordained for him. So though there were many forms of superstition and ignorance to be overcome, he had already made some of the most difficult social steps a new believer in the 10/40 Window must make. During the week he worked in the city, but on weekends he would often come up the mountain to stay at my place located on the university campus. We would spend time hanging out on campus or just lounging around my apartment. Besides helping me with my Chinese study, he would give me lessons in the ABC’s of the Tibetan language. I would openly share about Christ and the difference he had made in my life. He was interested in what I had to share but didn’t immediately understand that I was saying something different than what Tibetan Buddhism had to offer. Since that religion accepts the existence of many so called gods, adding one more name, Jesus, to the list didn’t seem matter much. It was only after watching a movie called The Jesus Film, based on the Gospel of Luke, that he began to understand why Jesus was totally different than the superstitious doctrines of the Dalai Lama. After watching the movie he shared with me his growing concern about a medical condition he had. He had recently found out that he had a hole in his heart, and was understandably upset. While watching the Jesus Film he noticed that Jesus was a great healer. I told him that since Jesus is still alive and has all authority in heaven and earth, he could be healed of his heart condition. I prayed for him, and he was grateful, though nothing noticeable happened at that point. A week or two later he came to me with great excitement written all over his face. He shared that after going to the hospital for tests the doctor told him that the hole in his heart had shrunk to half the size. After hearing this news I got out my Bible and shared with him the story of the blind man that Jesus healed after touching him twice. I pointed out to him that the first time the man came to Jesus he was led there by his friends. But after Jesus touched him that initial time he was only partially healed. The blind man said that he could see but it was still unclear. I explained to Dawa that the first touch was not due to the man’s own faith, but the faith of his friends. But after receiving a partial healing, faith grew in his heart so that he could receive a complete healing from Jesus. I shared with him that the partial healing he himself had received was due to God’s gracious response to my faith in bringing him to Jesus through prayer. I then promised him that if he placed his trust fully in Christ he would be totally healed. Faith had already been put in his spiritual heart, even as his physical heart received a partial healing, so he quickly confessed that he was ready to follow Jesus. We prayed again for his healing, and also for him to receive Christ into his life. A couple days later I baptized him in my bathtub and began to teach him how to read his Bible and pray. Not too much time passed before he came and told me that further tests revealed that there was no longer anything wrong with his heart! The hole in his heart had been filled, in more ways than one! From the day he committed himself to Christ, he has never gone back to his old superstitions. At that season of life I had not yet found my present fellowship, Praise Chapel Christian Fellowship. And I still believed the false report that not much could be done in terms of church planting under the oppression of the Chinese government because I didn’t have the radical radicalness of my present fellowship to challenge me to push the limits! But I gave Dawa what I had, and he came to a firm faith. The best counsel I could give to him was to go to the official government church in the city. He listened to my counsel and started to go faithfully. The government churches in China are comparable to something like a large traditional church in America. Most of the basic teachings are orthodox, but genuine spiritual fellowship and zeal was greatly lacking. I was content that at least he was hearing the Bible taught in a language he could understand, while continuing to come to me for help with any particular questions he was dealing with. Soon God put it into my heart that I needed to return to the States and find a church that I could build a closer relationship with. So by June of 1999 I left Chongqing and returned to America. When I returned to China in August of 2000 I kept in touch with Dawa as much as our nomadic lifestyles allowed, but I was living in a region very far from Chongqing. He was still living in that city and still going to church regularly. But due to the fact that the church he was attending was not really structured to build close relationships, and that Tibetans are not generally warmly received by Chinese, he was all alone in his walk of faith. Because of his isolation he had not greatly developed in his faith, though I praise God that through the years he has continued to move forward as much an isolated Christian can. This is one of the greatest problems in the 10/40 Window. Though an individual might come to Christ, he is often left alone without fellowship. It is not like living in the States where one can go church hopping until he finds a suitable church home. There are usually few or no churches. In Chongqing there are hundreds of small house churches scattered among the 30 million or so Chinese, but they are all by invitation only. So unless the isolated believer happened to come across a Christian in that primarily atheistic and Buddhist city, it is unlikely he could ever find a church. And even if he did find a house church to attend it is likely that the church would be influenced by strange and dangerous teachings due to the closed and isolated nature of the individual congregations. The 10/40 Window is dark and lonely, even for those that have been introduced to Christ. So Dawa continued in his faith, though his progress in discipleship was obviously slow. Nevertheless, he was sincere and did the best he could to share his new faith. His co-workers were all atheists and had no interest in his faith, but he was accepted by them nonetheless. His reputation as a Christian soon put him in an interesting and certainly unorthodox situation. One night Dawa’s boss and his girlfriend, along with other co-workers and Dawa were out to dinner. People were giving the couple a hard time for dating so long without getting married. Being atheists, getting married was just a legal formality in their minds. But as the group teased the couple, someone had an idea. They had seen enough wedding scenes from Hollywood movies to know that the only thing you really needed to get married was a Christian priest. It’s true that a white flowing wedding gown is also preferable, but if boiled down to the fundamentals they concluded that the priest was all that was necessary. Their practical Chinese minds couldn’t see any reason why any average Christian couldn’t fill the role of the priest and perform the ceremony. So they unanimously turned to Dawa and asked him to marry them right there on the spot! Dawa was reluctant, but didn’t really know enough of Christian practices to have any theological objections to the proposal. So he agreed to marry them. I’m not sure as to the particulars of his benediction, but I am sure it didn’t consist of anything more than a simple prayer and declaration of their union. Chinese culture probably added a hearty and long-winded toast from one of the co-workers and I’m sure the Hollywood influence was manifested in the kissing of the bride. Such innocent and naïve scenes are played out daily throughout the 10/40 Window where Hollywood has been the only means of any understanding, or misunderstanding, of Christianity. I don’t know whether to laugh at the fact that God can even use godless Hollywood to bring in a slightly Christian influence, or weep for the Church who has left the task of propagating the Gospel in the unworthy and incapable hands of American film makers! The situation in Chongqing is bad in terms of finding a place of fellowship, but in Tibet it is virtually impossible. After working in Chongqing for several years Dawa moved back to his hometown of Lhasa and found that even the chance of fellowshipping at the official government church was not possible. Lhasa is a small city, according to Chinese standards, of no more than about 250,000 people. 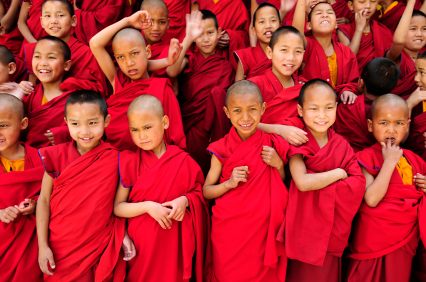 Since Tibetan Buddhism is the only religion among the Tibetans, and atheism rules the hearts of the Chinese, there is no official Christian church. There are a few scattered house churches, each consisting of 5-20 members hidden somewhere among the residents of the city, but no place visible to a lone Tibetan believer. In light of this situation I encouraged Dawa to approach some of the rare foreign residents of the city. From experience I know that some of the foreign students and teachers are likely to be missionaries. But Dawa was not able to find any believers among the foreigners or the Chinese, much less among the Tibetans. In one of our phone conversations he asked me to send him some Bibles via post. At that point the Tibetan Bible was not yet completely translated, and I wouldn’t have known where to find one had it been, so I sent him several Chinese Bibles to the address he gave me. The next time I talked to him he said that he had quickly given them all away. This was great news, but I couldn’t help feeling a little depressed as I acknowledged to myself how insufficient a few Chinese Bibles were, among a mostly illiterate and Tibetan-speaking population. Within a couple years of living in Lhasa he came to feel he needed to marry. But of course marrying a Christian was not an option since he didn’t know any. So he met a Chinese girl and they were soon engaged. She was a nominal Chinese Buddhist, and they married in a Chinese Buddhist temple. Of course this wasn’t ideal by any biblical standard, but since it was merely a formality, he finally consented to it. Not too long after this we lost contact with each other due to the losing and changing of phone numbers. But I have no doubt that Dawa has continued in his lonely faith to the degree that he understands it. Poverty, political oppression, religious superstition, added to a scarcity of laborers, believers and materials: this is the 10/40 Window in a nutshell! The experience of Dawa that I have laid out for us is common in this unreached region of the world. The Gospel has reached a few, but laborers are scarce and struggle against demonically inspired intimidation. It is into this dire situation that Body of Christ is called to enter. We have the Lord of heaven and earth telling us to “Go and make disciples of ALL nations”! So, though many might think that the door to the 10/40 Window is closed to Gospel laborers, we must see it as an open window of opportunity! Hi Christopher, this is tashi . I am Tibetan believer . Can you introduce me to dawa . Is he still a believer. Im glad to hear you are walking with the Lord. I still pray for Dawa, but unfortunately i lost contact with him many years ago. So I just commit him to the grace of the Lord daily. I pray you will stand bold & unmoved in the Lord.